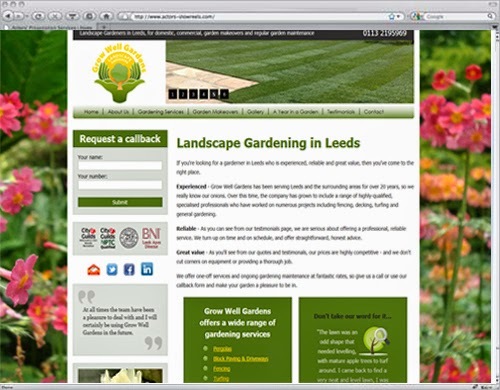 We were proud to create the new website for Grow Well Gardens, a fantastic landscape gardener in Leeds. Grow Well Gardens is run by Rob, a charming fellow who really knows his Rhododendrons from his Azaleas. Rob had a basic Flash website that wasn’t doing anything useful – not getting any leads and not really impressing clients who went there directly. We did a brand new web design, bringing the visuals up to date, including lots of trust-building logos that represent the company’s qualifications, experience and associations, links to social media and comprehensive details of the various services offered. We realised that pictures really say it all when it comes to gardening, so the site includes a range of high quality interactive slideshows which allow visitors to browse through a wide variety of before and after pictures. This builds trust and proves the quality of work, and also offers inspiration to new customers. The website also features ‘A Year in a Garden’ page which offers visitors advice and tips on the most important things to do in their gardens at each of the different seasons. Offering free information like this serves several useful purposes – it builds trusts with visitors, who can see that the company really does have expertise, and it helps from an SEO point of view. That’s because Google loves content, and is more inclined to highly rank a website that offers good quality relevant content than one which just lists services and prices. Rob employs a team of enthusiastic gardeners and invests in high quality equipment, which means the efficiency and quality of the work is second to none. They handle everything from garden clearances to regular garden maintenance to fencing, turfing, patios and driveways and basically everything garden related. If you need a gardener in Leeds and the surrounding area, they come highly recommended! And of course if you’d like us to work similar magic on your website, then visit our main web design website. As a business owner I recognise the importance of providing a friendly and professional service to clients and therefore I have high expectations of any business professionals that I choose to trust and work with. Grow Well Gardens website was well overdue a complete re design, after speaking with a few different web designers I choose to use Sentiva. The whole process was made clear from the start and was explained in a way so that even I could understand. Communication was great throughout so that I felt part of the process from beginning to end. Kat and her team came up with a fantastic design which met and exceeded my expectations which is just what I need to push Grow Well Gardens forward. The whole experience with Sentiva was a pleasure from the beginning to end and I would have no hesitation in recommending them to my friends, family and work colleagues.